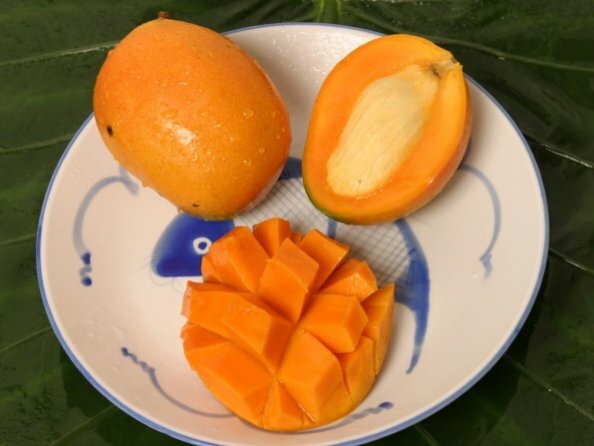 &QUOT;GOLD NUGGET&QUOT; IS ANOTHER EXCELLENT VIRTUALLY FIBERLESS FLORIDA MANGO. IT IS BELIEVED TO BE A SEEDLING OF EDWARDS, BUT HAS SEVERAL ADVANTAGES OVER IT'S PROBABLE PARENT. FIRST AND FOREMOST GOLD NUGGET IS EXTREMELY PROLIFIC WHICH IS IN STARK CONTRAST TO THE SHY BEARING EDWARDS. SECOND, IT FRUITS LATER IN THE YEAR, MAKING IT ONE OF THE MOST SOUGHT AFTER LATE SEASON MANGOS. FINALLY, IT HAS EXCELLENT HARVESTING AND HANDLING CHARACTERISTICS AS COMPARED TO THE DELICATE NATURE OF THE EDWARD. THE TREE ITSELF IS A LARGE VIGOROUS GROWER WITH AN OPEN CANOPY. THE FRUIT RIPENS LATE JULY TO AUGUST.